denishurley January 1, 2018 January 2, 2018 No Comments on Liverpool blue and Everton red? As we said in the piece looking at the seasons where Arsenal had four goalkeeper shirts, netminders have too many options nowadays. Three options per team is standard, usually in black or an offensive dayglo shade. It’s no surprise to see your keeper clad in varying shades from game to game, unlike the days were green dominated and any change was worthy of comment. One would think that, with alternative goalkeeper shirts so rare, finding a different colour to green wouldn’t pose a problem, but we’ve found at least two examples where Everton used a red goalkeeper shirt and also two instances of Liverpool using a blue one. The most high-profile of these is the earliest of the four we’ll look at, Neville Southall’s shirt when Everton beat Rapid Vienna 3-1 in the 1985 European Cup Winners’ Cup final. The thing people ask me about most regarding the final was my goalkeeper shirt. It was red, a colour many Everton fans consider sacrilegious. But there was an odd logic to me wearing it. Because Rapid played in green and white stripes I couldn’t wear my usual green, nor white. Black was out because that’s what the the referees played in, and so was blue for obvious reasons. Yellow was also out because that was only allowed in international matches. Which didn’t leave an awful lot more choice. Later at Everton, I wore orange and pink and I think now you can wear whatever you want. But back then it was a bit more straightforward: primary colours, which pretty much left red. It’s interesting to note above that, while the shirt was made by Le Coq Sportif, there was a bit of guerrilla marketing for Southall’s glove sponsor Sondico on the collar. Five years later, he would again wear red, though without being as limited in his options. Sheffield Wednesday had a green and white change kit in 1988-89 and 1989-90 and in the first of those seasons, Southall wore a yellow version of Umbro’s ‘Hampden’ shirt when the Owls came to Goodison Park. The Hampden was also available in grey but in January 1990, Southall used red against Wednesday. Across Stanley Park, the opposite occurred twice, too. In Liverpool’s first season with adidas, 1985-86, Bruce Grobbelaar mainly wore yellow and occasionally white, but green – in the diagonally striped style – was favoured for 1986-87. In the summer of 1987, Liverpool played Celtic in Tommy Burns’ testimonial at Celtic Park. 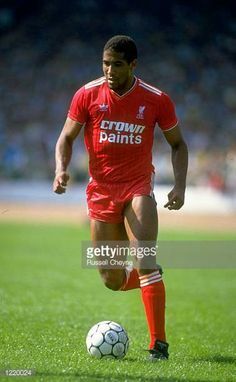 It was one of the last times that the 1985-87 home kit was worn – it seems anachronistic to see John Barnes wearing it – and due to the large amounts of green on the Celtic kit, Grobbelaar changed, to a blue shirt. Oddly, Liverpool also played Bayern Munich that summer, in Dieter Hoeness’s testimonial, and Grobbelaar wore blue in that game too. Like Southall in red, Liverpool goalkeepers in blue wasn’t a one-off, either. When the new Premier League began in 1992-93, a noticeable new departure was that match officials now wore green shirts, rather than black. It meant that black kits were now an option – one that Manchester United would exploit for 1993-94 – but it also resulted in the league’s goalkeepers having to deviate away from their traditional colour. As in 1991-92, Liverpool’s alternative goalkeeper shirt was yellow, but it couldn’t be worn against Sheffield United’s yellow away kit at Anfield for the second game of the season on August 19. It meant that David James took to the field in a top the same as Arsenal’s first-choice goalkeeper shirt that season. Liverpool won 2-1, but clearly there were misgivings about the blue shirt, as it was the only time it was seen. Instead, a grey and black version of the shirt was pushed into action when required. And, as far as we know, in the intervening 25 and a half years, Merseyside goalkeepers have not worn their rivals’ colours.